Indian Premier League organizers confirm the completing of a unique deal with Google India. (CNN) -- Google India has brokered a groundbreaking two-year deal with Global Cricket Ventures, the licensing partner to the Indian Premier League, giving them exclusive rights to stream live cricket matches from the IPL on YouTube. 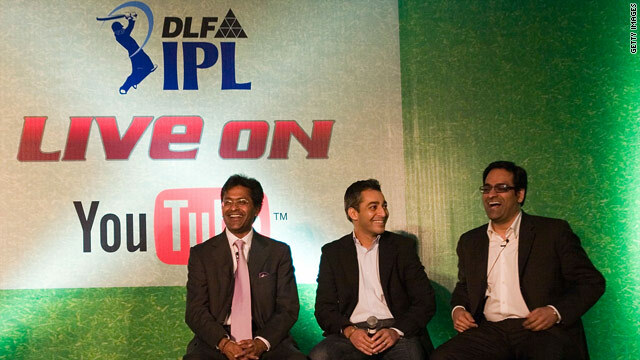 Viewers will be able to watch all 60 matches in the 2010 IPL for free on a dedicated online channel which will include match highlights, player interviews, pitch reports as well as an exclusive "YouTube View" which will not be available to those watching on television. The deal marks a worldwide first in live streaming of any global sporting event where action is expected to reach half-a-billion viewers during the 45 day tournament. Lalit Modi, chairman and commissioner of the IPL, told The Daily Telegraph: "This changes the world of sports broadcasting. The Internet has changed the lives of everyone and this will do the same for sport. Modi also said in a press release: "I am certain that this new innovation will significantly enrich the user experience of the global cricket fan with a direct window to the on-field action through next generation technologies." "During the IPL season, the biggest and most talked-about cricket tournament in the world, YouTube will offer innovative and engaging advertising opportunities to companies which help them build stronger online brand associations and engage the audience." The 2010 IPL begins in Hyderabad on March 12, with last year's winners Deccan Chargers taking on Kolkata Knight Riders.